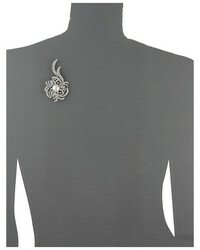 Why not try pairing a dark brown fur coat with a Nina Janice Brooch Brooches Pins from Zappos? As well as very comfy, these pieces look good worn together. When it comes to footwear, go for something on the classier end of the spectrum and complete this outfit with black leather ankle boots. A black cable sweater and a Nina Janice Brooch Brooches Pins married together are a total eye candy for ladies who prefer relaxed styles. Black suede over the knee boots will bring a sense of sophistication to an otherwise simple look. Definitive proof that a light blue denim jacket and a Nina silver brooch are awesome when combined together in a relaxed look. Put a classier spin on your getup with tan leather pumps. 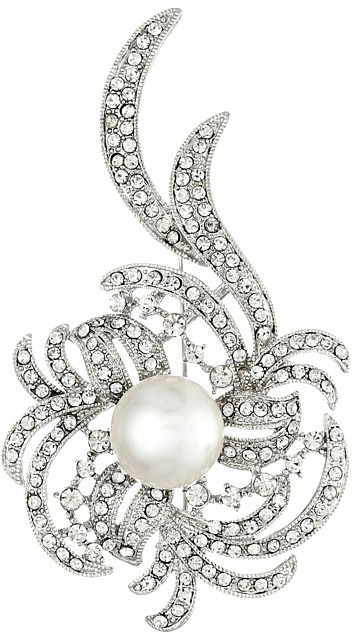 This combo of a white vest and a silver brooch is incredibly chic and yet it's easy and apt for anything. Complement this look with a pair of black cutout leather ankle boots for a hint of sophistication. Putting together a beige fluffy coat with a Nina silver brooch is an on-point pick for a casual getup. As for footwear, make white snow boots your footwear choice.